When you first see the Hummingbird acoustic guitar, you get the feeling that you’ve seen it somewhere before. And you probably had, with the sheer number of celebrated music artists counting the Hummingbird as one of their favorites and using it for composing songs, recording music and performing live. Notable Hummingbird players include Keith Richards, Mick Jagger, Brian May, Chris Cornell, Sheryl Crow, Thom Yorke, Michelle Branch and Noel Gallagher. Now, there are basically two kinds of Hummingbirds: one made by Gibson and another made by Epiphone. The two companies used to be fierce rivals until Epiphone became a Gibson subsidiary. Epiphone now has a reputation for producing Gibson-quality guitars at a not-so-Gibson price – like the Hummingbird, which was introduced in the ‘60s. 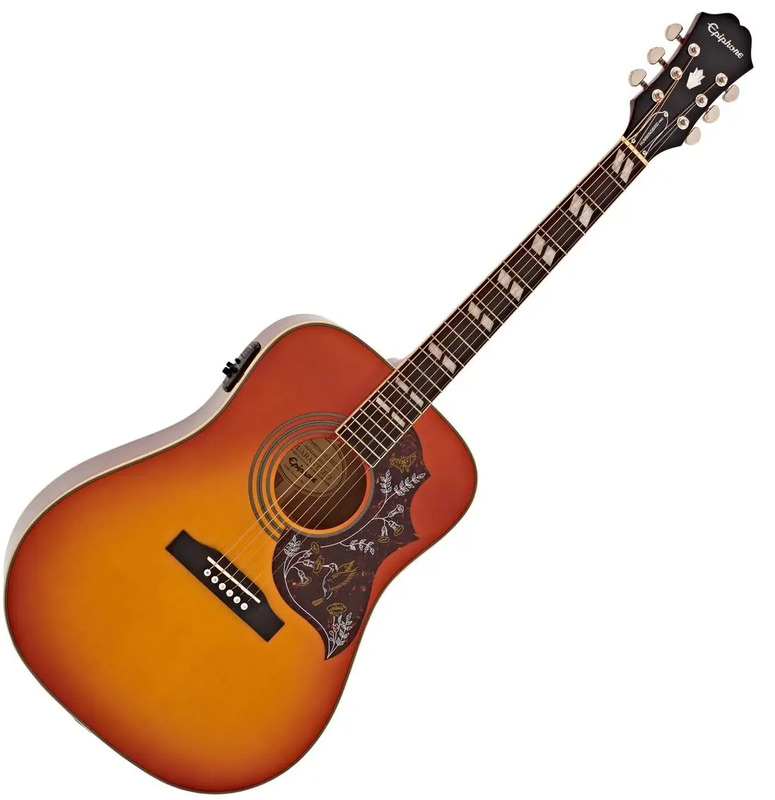 Epiphone reintroduced its version of the Gibson Hummingbird in 2012, calling it the Hummingbird Pro. It’s what we are doing a review of because at less than $400, it’s what most of us can actually afford at the beginning phases of our music career. Check back again for a review of the Gibson when we’ve scrounged enough money from gigs for it (it can take a while, though). Gibson dreams aside, we’re not regarding the Hummingbird Pro by Epiphone as a second placer. After all, comparing a high-end Gibson with a pocket-friendly Epiphone is hardly fair. So we’re taking a look at the qualities that make the Epiphone Hummingbird Pro acoustic-electric guitar great on its own. Let’s get started! The Epiphone Hummingbird Pro has undergone a number of improvements over the years. 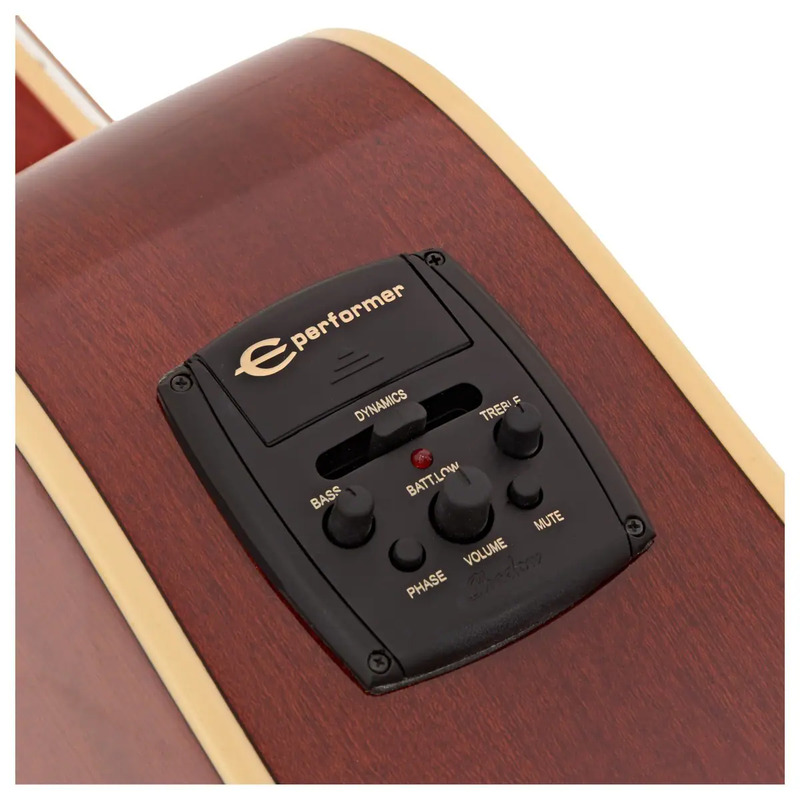 The latest upgrades to the square-shouldered dreadnought guitar include the Shadow ePerformer preamp and the Shadow NanoFlex pickup system for better performance on and off the stage. The top of the Epiphone Hummingbird Pro is made of solid spruce while the neck, back and sides sport laminated select mahogany wood. The solid spruce top improves with age – with some proper TLC of course – so you can be sure it sounds as good as it looks. The neck has a SlimTaper profile with a comfortably playable D shape. This neck profile became famous during the Sixties and is meant to promote speed and reduce fatigue when playing. The top of the guitar sports a 5-ply black and white binding, while the back and the fingerboard have a single-ply white binding. The Epiphone Hummingbird Pro comes in a striking Faded Cherry Burst finish. Pearloid parallelograms serve as markers on the rosewood fretboard. The guitar inlays are effective as a visual aid so you can easily guide your fretting hand to the notes you want to play. With the pearloid inlays, you can more quickly tell which fret you are playing when looking down the guitar neck. The scale length of the Epiphone Hummingbird Pro is at 24.75 inches and the nut width measures 1.68 inches. The guitar has a rosewood reverse belly bridge with a compensated imitation bone saddle, sturdy Grover tuning machine heads, adjustable truss rod and an imitation tortoiseshell pickguard. And of course, it wouldn’t be a Hummingbird guitar without the traditional hummingbird-and-flowers artwork, which very nicely stands out amid the dark pickguard. The guitar also has the trademark sloped dovewing headstock, which bears the Epiphone logo in white letters. As for the onboard electronics, the controls for the preamp are located on the upper bout. Aside from a low battery indicator, there are controls for Master Volume, Mute and Treble and Bass EQ. There is also a Dynamics control slider. The pickup system, hidden away inside the soundhole just under the saddle, picks up the vibration of the strings with no problems at all. What’s missing in the system is a built-in tuner. On the bright side, this means you have a choice of using your preferred tuner. The overall build quality is impressive. It shows fine attention to detail and good craftsmanship. It’s easy and comfortable to play, and with its vintage appeal, you’ll find it hard to look away. 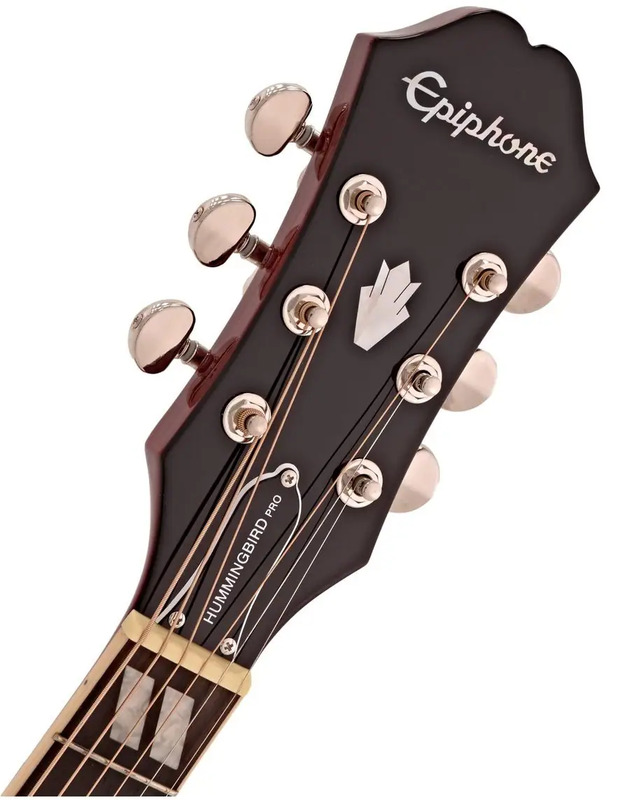 The tonewoods give the Epiphone Hummingbird Pro an amazing sound quality. The solid spruce top gives the guitar plenty of resonance, making it sound big indeed. The guitar’s tone is bright, warm and rich, with a good balance across the registers. This versatile guitar does well when playing different music genres, from rock to blues and jazz. There’s enough low-end heft for heavy strums and rock riffs. Notes are crisp and clear for fingerstyle playing and flatpicking. Now, let’s take a moment to dig a little deeper into the Hummingbird Pro’s electronics. According to Epiphone, it has been working with Germany-based electronics company Shadow for more than a decade, looking for ways to amplify an acoustic guitar without it losing its acoustic sound. This partnership resulted in the development of the NanoFlex pickup and ePerformer Preamp. The preamp does very well in amplifying the acoustic sound naturally. When the guitar is plugged in, bright tones sound brighter and the lows sound deeper without taking away the acoustic-ness. The controls are also pretty straightforward so you can easily tweak the output to come up with the sound you’re going for. All in all, the Epiphone Hummingbird Pro sounds perfectly good, especially for its price. Why buy the Epiphone Hummingbird Pro? The Hummingbird is a classic guitar trusted by a multitude of musicians the world over. The Epiphone Hummingbird Pro is a great modern version of this legendary instrument, and it’s something you’ll be proud to have as a musician whether you’re a beginner or a seasoned pro. Is it worth the buy for beginners? Well, yes. It’s a beautiful guitar you may not even want to put down – which is good for those who may need the motivation to practice every day. It’s comfortable and fun to play, equipped with good-quality electronics and built to last. It’s something you won’t be embarrassed to take out of the house for lessons, jamming sessions or a couple of hours of practice in the park. If you have $300 to spend on a guitar, this is one of the best models you can buy.